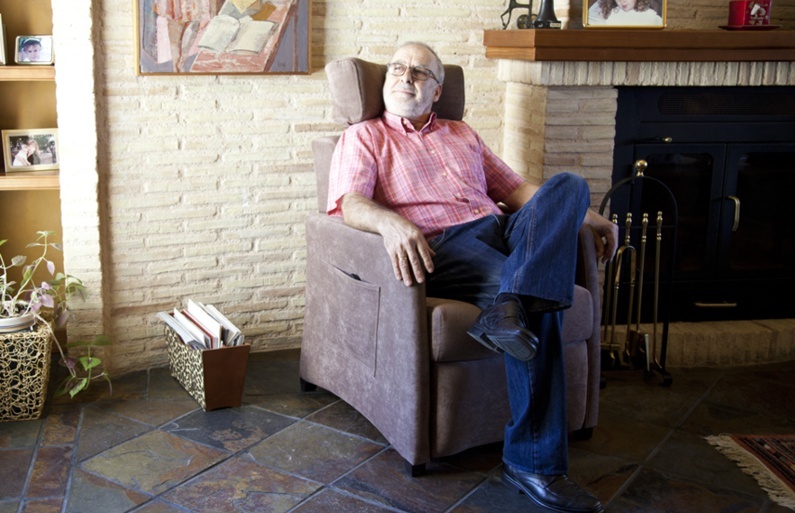 While most recliners on the market are wing chairs because many people find them very comfortable, we have found out that when the user has back or neck problems, the wings may favour an incorrect and uncomfortable position. Therefore, in addition to the more classical wing chairs Donatello and Raphael, we have designed models Leonardo and Michelangelo as part of the Toscana Collection, with an adjustable headrest to favour a straight position. The headrest can be opened or closed as we need it, and it can be adjusted in height. Many of the recliners in the market are very deep and the back has much inclination, what makes them very uncomfortable for old people. We have all seen our parents put a cushion on the back of the chair to reduce the depth. For this reason the armchairs from the Toscana Collection are shallower than usual, and they have been designed with a straighter back to make them much more comfortable. Models Leonardo and Michelangelo include a thin back cushion of memory foam or 36kg. soft foam to make the chairs even shallower, and allow a more upright position. The footrest has been designed with curved shape (inwards) to make it more comfortable, avoiding that the legs fall to the sides. We have detected that it is a fairly common problem that with straight footrests or with footrest curved outwards, the legs slide sideways, which is very uncomfortable. The seat is firm to make it more comfortable for seniors (it is not truth that soft foams are more comfortable; when sitting for long in the same position hard seats are more comfortable. Think about car seats: they are all hard). Also keep in mind that the polyurethane foam seat is 33kg instead of 25 or 30kg. usually used in this type of chairs, which will prevent the seat from losing volume with continued use. 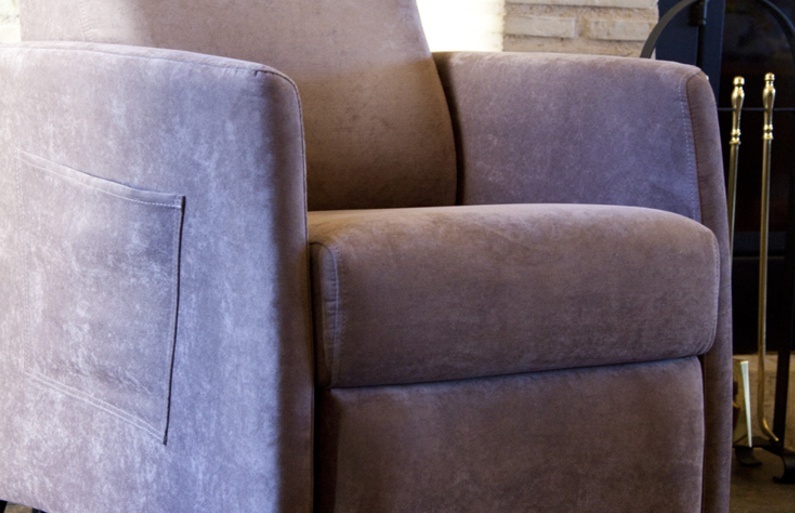 Furthermore, the seat cushion has been designed slightly thicker on the front to avoid sliding forward (this is usually another problem from this type of recliners). The arms of the armchairs in this collection are slightly higher than usual; this allows us to stay in an upright position with our arms resting completely. 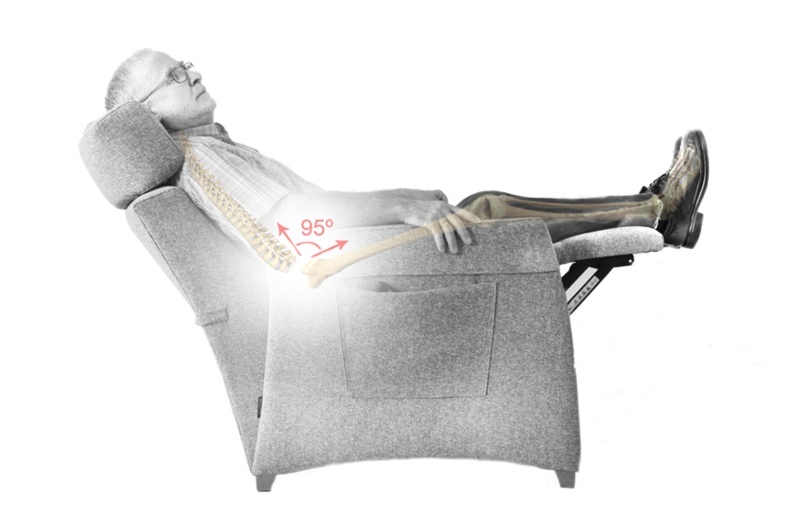 The reclining mechanism favours a good resting heart position, since it raises our legs up to our heart level to lower the heart rate. Moreover, in this position we keep the same angle between our back and legs as just sitting, avoiding the usual dizziness caused when the back reclines too much. 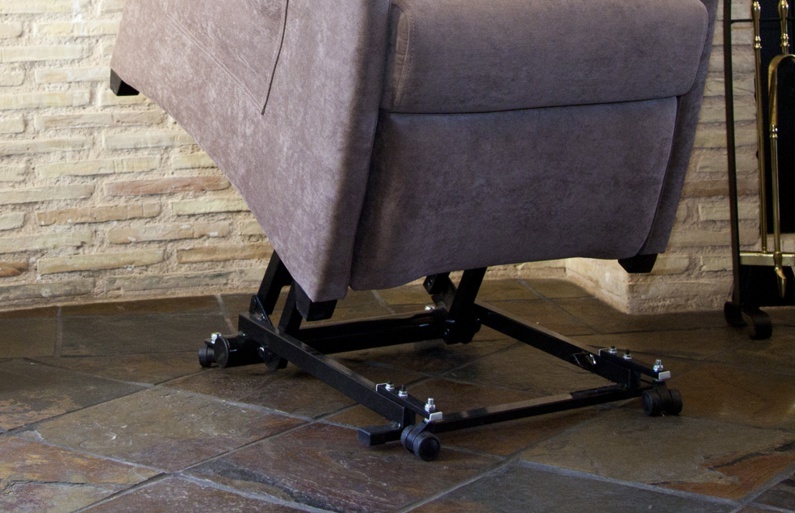 To avoid mobility problems we have created a patented mechanism with castors to move the armchair as if it was a wheel chair. Moreover, with the option of thin arm in models Leonardo and Raphael (68cm the width of the armchair), we can move the chair through doorways. 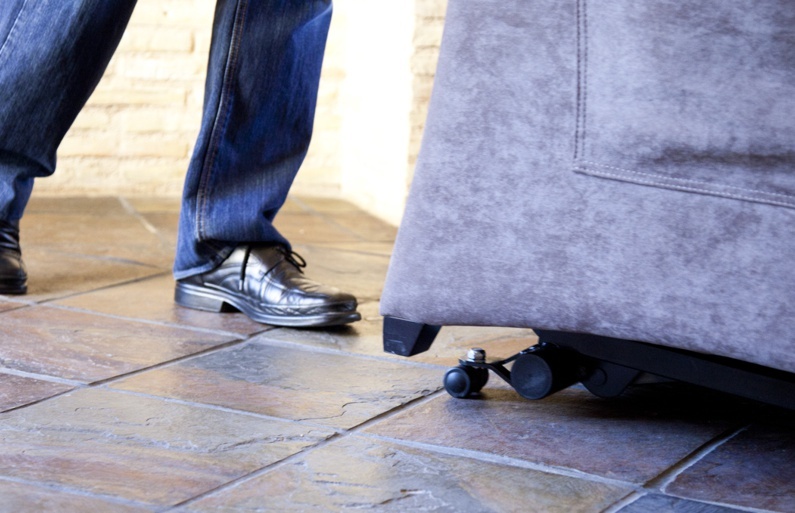 Additionally, we have a patented braking system on the powerlift system that allows us to adjust the height and set the position without operating any pedal or having to manually lock the castors. This way the person can sit up straight for lunch for example, thus avoiding having to change to another seat. 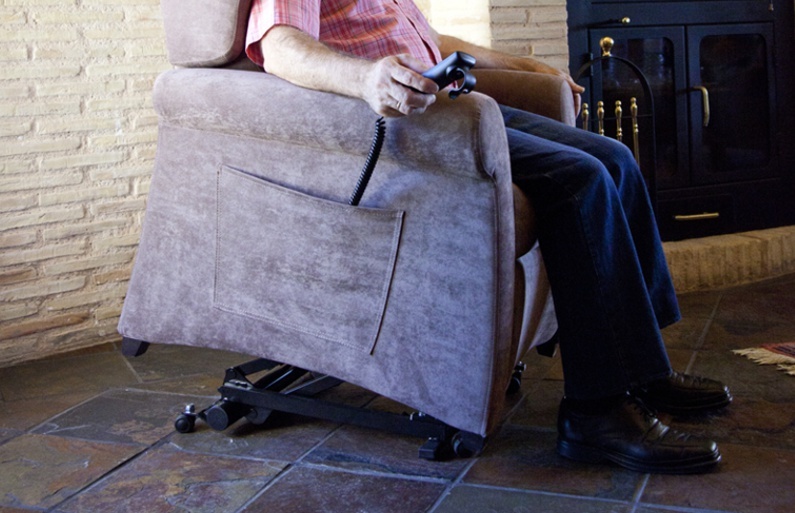 Many of the lifting chairs designed for seniors in the market are sold in like-leather or PVC, which is quite uncomfortable (it is warm and sticks in summer and it is very cold in winter), so they end up being used with a sheet on the top (which becomes really uncomfortable when it wrinkles, and may even cause wounds). We run away from this trend because we think that it adds no advantages, not even in terms of cleaning, because if the person needs it, there are means to prevent incontinence problems. Moreover, we use fabrics with Stain Free and Aqua Clean treatments. Also they are treated against mites, fungi and bacteria. They have all the cleaning advantages of the imitation leather, but it is breathable and has a much nicer touch. Another problem of synthetic leather is that it peels with use. Although manufacturers offer a 2 years guarantee, it is very common that these problems appear around this time in the areas with more friction, such as the arms and the front of the seat. For this reason we recommend the use of these Aqua Clean fabrics, which are softer and nicer, and at the same time, much more resistant and durable. In addition, there are optional arm covers, as well as an optional back cover for models Donatello and Raphael. 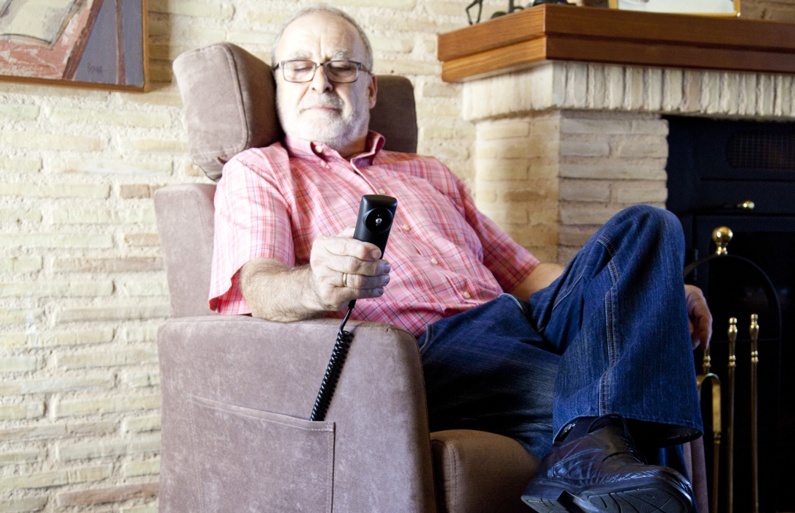 The motor to operate the reclining and the lifting actions is electric and needs to be plugged in.Similar mechanisms can be found in the market, but many have the manual system, which is very difficult to operate for seniors (they cannot close the reclining mechanism). 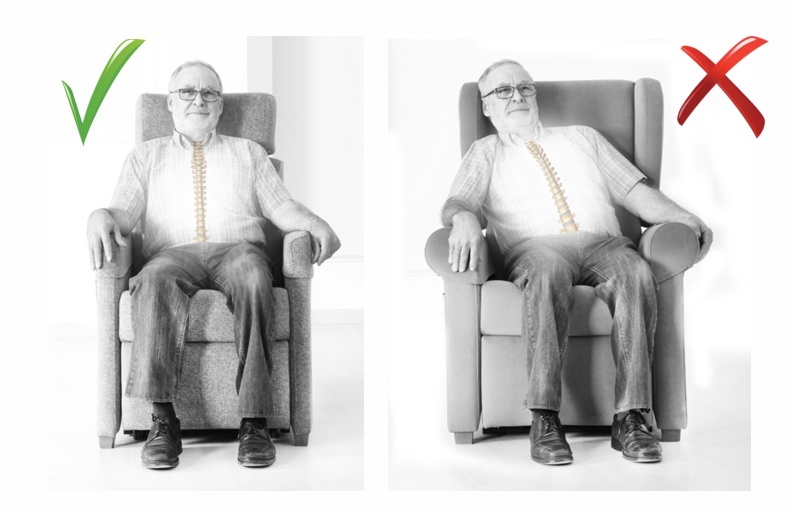 We demonstrate that armchairs with one motor may be better than armchairs with two motors. 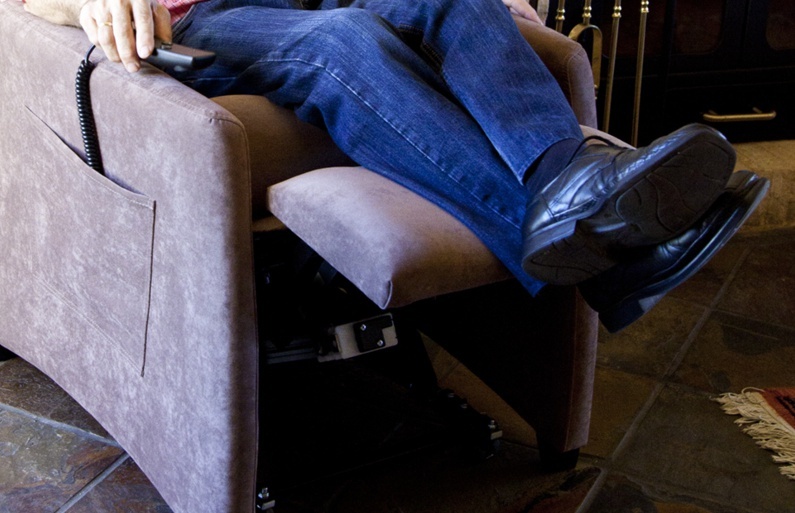 In fact, with only one motor we can recline the chair to the most comfortable position, without changing the angle between the seat and back, and we can also operate the powerlift system. 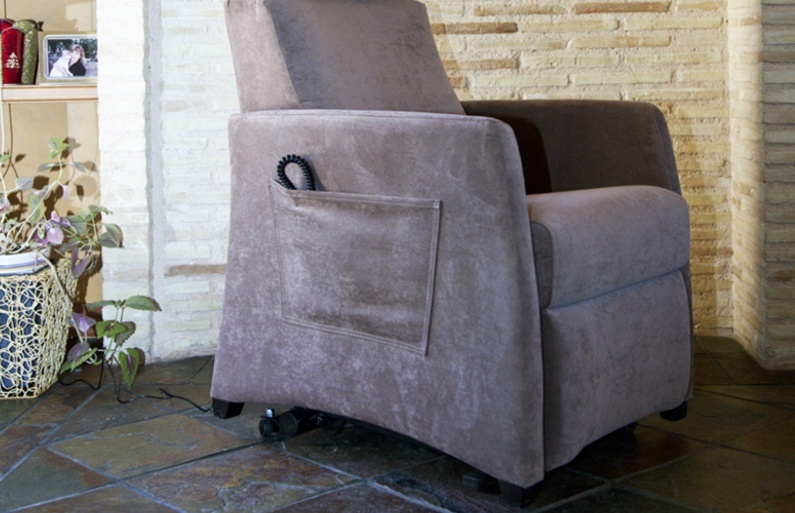 Optionally, the armchairs from the Toscana Collection can be ordered without the powerlift system, just as electric recliners. 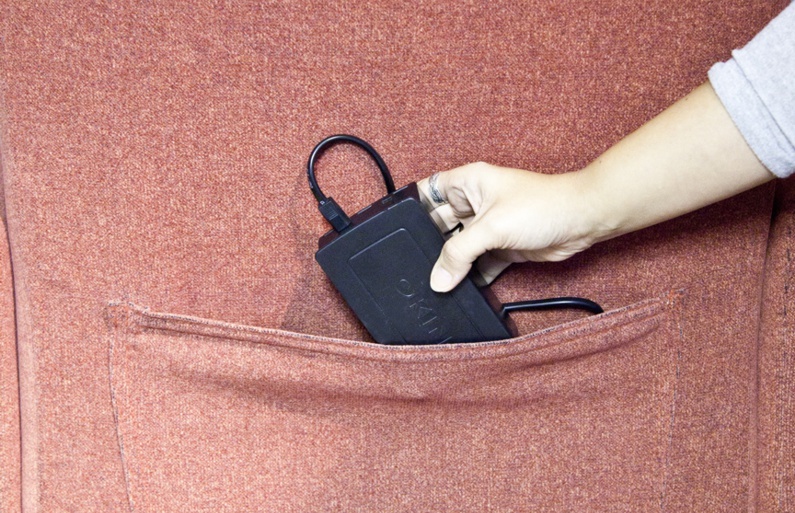 We offer an optional battery pack to avoid cables. It is a long life battery; depending on the use it may have a working life from 1 week to 3 months. To charge it, it is not necessary to remove it from the armchair. We have incorporated a pocket to hide the cable and battery pack at the back of the chair in a high position. Just take the cable out and plug it in. 14.- First quality raw materials. 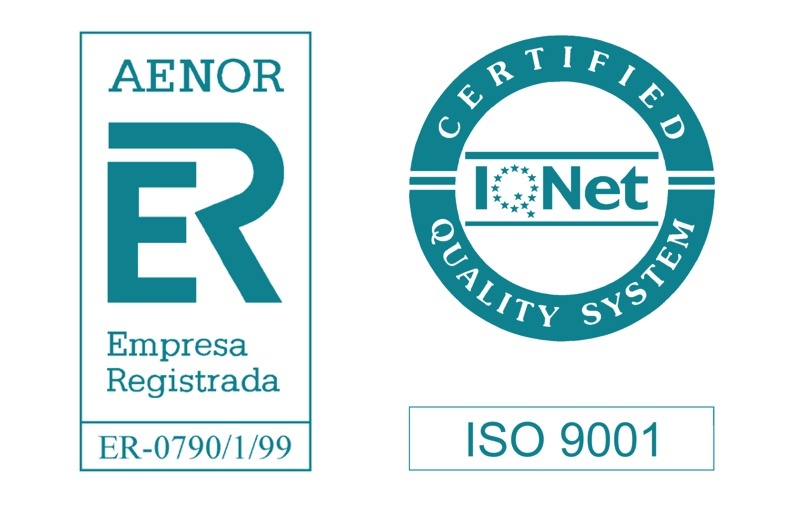 We use first quality raw materials and all our products and processes are certified by Aenor according to the regulation ISO 9001. The materials used in the armchairs from this collection are 35kg. polyurethane foam on the seats, memory foam on the headrest and back cushion, fibre coating on the whole chair, NEA seat suspension, and pine and MDF frame. Our frames are guaranteed for life, the seat suspension for 10 years, the mechanisms for 5 years and the rest of the components for 2 years.